In the 90's the Nissan Maxima was positioned as a bridge between the median family sedans and the exclusive European sports sedans thanks to its powerful V6 engine, high quality interior and the fact it was sold as a “four-door sports car”. These features, along with continuous improvements made by Nissan, ensured the appreciation of the Maxima followers with strong name recognition. Nissan Maxima 2004. The sixth generation of the Maxima had very few changes in its lifetime. If you want to know more about this car and where to find the cheapest for sale from 2004 to 2008, please check this article at the end, meanwhile I'm going to tell you a little bit about this fantastic and dependable vehicle made by this Japanese company. The sixth generation of the car lasted from 2004 to 2008. This Maxima was longer, wider and more powerful than previous generations, but even so it took some work to compete with models from other brands. It was offered in two models: SE and SL. With a slightly harder suspension, the SE was the sportiest version. The standard equipment included 18-inch wheels, premium sound system with 8 speakers, keyless entry and front windows with one-touch activation. The SL model which was more focused on luxury had 17-inch wheels, softer suspension, interior with wood accents, heated leather seats and Bose sound system of 320 watts. The changes during its lifetime were very few, so if you are looking for one, do not need to look for a specific year, although there was a change of transmission. The Nissan Maxima of 2007 and 2008 used the CVT gearbox, while the former had an automatic 5 or 6-speed manual. The first CVT gearboxes of Nissan were not so good, but the one used by the Maxima worked well. The V6 offering the latest models of this generation has 255 horsepower, while the oldest had 265 hp. This is due to legislation that changed how to measure the horsepower on new cars since 2007, but in fact the engine had no any change. In the review it was determined that the sixth-generation of the Maxima offered more power, comfort and interior space compared to other cars of the segment with V6engine. The dynamic behavior of this generation did not impress as much as in other cars of the competition. 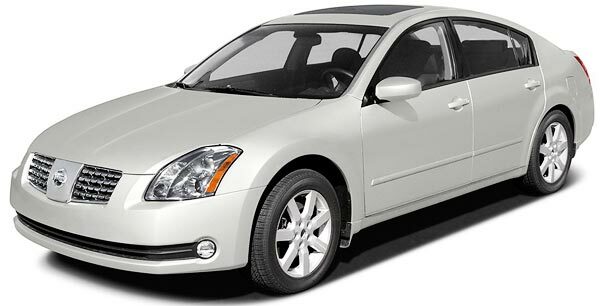 If you are looking for a used car in this range of years, the Nissan Maxima is one that is worth turn around to see it. Its dynamic behavior may not be the best, but in terms of comfort and amenities there are few cars in the segment that meet with everything offered by the Maxima. In case you are looking for where to find the cheapest Nissan Maxima for sale from years 2004 to 2008, we are going to tell you where to get the most affordable offered by USA dealers at the moment of writing this article. CHEAPEST NISSAN MAXIMA 2004 FOR SALE. This red one Maxima SE/SL is for sale in New York, NY by Sirius Auto Sales Inc and only has 88,000 miles. This dealer is only asking $2,999 What a great deal eh? If you are interested, give them a call to get more information at 888-598-1509 or hurry up! and visit them at 870 Atlantic Ave., New York NY 11238 We are sure, this Maxima will not last for so long, it looks great for this price. CHEAPEST NISSAN MAXIMA 2007. This grey Maxima is a SL trim model and is for sale in Brooklyn, NY by D & A Guaranteed Auto Sales Dealer. It comes with 108,834 and they are asking $7,999. If you are interested and want to know more about it, you can search for more info online with its VIN number: 1N4BA41E07C815031, give a phone call to the dealer at 888-698-6501 or visit them in 2417 Linden Blvd., Brooklyn, NY 11208. In conclusion, it seems the state of New York has the best prices of USA for those looking for where to buy an affordable used Nissan Maxima from years 2004, 2005, 2006, 2007 or 2008. If you want to continue with your search we recommend you to use this great source of used cars or you can also use our cheap car search tools to find the cheapest cars for sale in your area. If you are selling a Nissan Maxima for a better price than these posted, we appreciate you reply to this article.